Per accenderlo basta un oggetto appuntito perche si è staccato il tappo dell’interruttore. 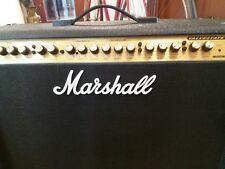 Usato pochissimo e in perfetto stato il Marshall Valvestate Pro 120-120 è 20 W a canale con la tecnologia valvestate introdotta da Marshall negli anni 90. By allowing you to match the impedance of the amp to the speaker load correctly, you will optimise the Valvestate characteristics of the Valvestate Pro 120/120. Classic Marshall rig used by countless artists over the years. Piccolo, pratico e dal grande suono. ma anche di perdere il lavoro di anni, se usato in maniera incosciente. Il Recesso è valido solo se il prodotto non è aperto, utilizzato e danneggiato. Vendo finale di potenza a RACK MARSHALL 8008. Dimensioni: 1 UNITÀ RACK standard. Dimensioni escluse alette rack: 43.5 per 26.5 per 4.5 cm. Peso: 6.5 kg circa. Potenza di uscita: 80 Watt per canale @ 4 ohm. Input e output: jack TS Controlli volume canale A e B Simulazione di suono valvolare inseribile tramite switch posteriore. Cavo di alimentazione non incluso (cavo VDE). L’apparecchio funziona perfettamente, sono un tecnico riparatore ed eseguo test di tutti gli apparecchi venduti. Soddisfatti o rimborsati! Amplificador Marshall Valvestate VS 265 Excelente! Funda amplificador Valvestate VS 265. El estado es Usado. Enviado con Correos: Paq Estándar. Compatible Models Marshall Valvestate 1958X 1974X DSL5C VS65R. Type Single Button Footswitch. Compatibile con seguenti Marshall P/n: PED801;. È progettato per la maggior parte degli amplificatori per chitarra con capacità di commutazione on / off. ( When we have sent a wrong item to you, we bear it. ). Most (if not all) combo amp/speaker units are a compromise in one way or another. This is where the Marshall VS65R hits the sweet spot. Fully working, sweet sounding versatile amp. Valvestate 2000 AVT 50. Marshall Valvestate -Amplifier. Valvestate 2000. By emulating the feel and response of an all-valve amplifier even more closely, the new AVT range perform. brilliantly and represent another major step forward in guitar sound technology. Marshall Valvestate VS15R Guitar Amp With Spring Reverb. Used, but reasonable condition; fully working. Excellent practice amp. Runs well at household volumes, but capable of more when required. Happy to post, but collection available available from West Midlands (B67). Feel free to post any questions. Marshall VS100H Valvestate Amp Head (USED). Condition is Used. comes with foot pedal, is missing a rubber foot on bottom, plays and sounds fantastic 100 watts of Marshall Valvestate technology! 3 channels. Loud enough to gig with, yet it won't break the bank. See photos for full cosmetic details. The amp is in lovely condition , no scuffs or tears on the body work - all lovely and clean inside and out. This amp also has a cover included. Would be better if picked up from Stowmarket can be arranged. Marshall Valvestate AVT 2000 Guitar Amplifier Head. You can rest assured that your order will make it there in one piece. · We operate in Ocean County, New Jersey. You must also ask for a quote before purchasing. Marshall Valve State 65. properly, amp is in very good to excellent condition. The Valvestate VS 265 ! The clean channel is typical of the clean channel on this Valvestate series.not Marshall's strong suit, but usable and musical enough. Also a great platform for pedals. 3 channels, onboard reverb and chorus.so many useful features on this cool amp. The Marshall AVT20 20W 1x10 Single Channel Combo Amp with Reverb is amazingly loud for its small size. The tube-based quality of its clean and overdrive modes will redefine your expectations of a low-powered, compact combo. Marshall Valvestate 2000 AVT 150H Amp Head w/ DFX, 150W, 4-Channel. Tube preamp! Speaking of crunch, switch over to the overdrive channel and you get what Marshall is renowned for. That unmistakable, powerful sounding drive and distortion that Marshall is the master at. Nice and clear, quite warm, a great platform for your pedals! The VS65R ! The clean channel is typical of the clean channel on this Valvestate series.usable and quite musical. You can really hear the difference that the tube makes in the sound of this amp.very bell like and with the complex harmonics that are only attainable with valves! Great condition Marshall Valvestate VS65R. I have certified this amp and tube to be without defect. Marshall Valvestate 10 Amplifier -. Made in Great Britain by Jim Marshall. Headphone and Output jack on front panel. There's light wear to the handle. It plays well and sounds great! For sale is my Marshall Valvestate VS265 2x12 combo. The amp is a hybrid with an EC833 (12AX7) valve in the preamp and all solid state power amp. Tone wise it can go from pure glassy cleans (cleaner than any all-valve Marshall I've owned!). Model: AVT 20 - Valvestate 2000 - 20 Watt Output. VERY NICE CONDITION Marshall Valvestate S80 Model 8240 Stereo 2x12 RAW CAB CABINET W Corners. * HAS ORIGINAL MARSHALL CORNERS (NO CRACKS OR BREAKS) * THE UNIQUE 8 CHASSIS MOUNTING HOLES IN THE TOP *Measures 25-1/2" Length x 9- 9/16" Width x 19-11/16" Height *** NO TEARS OF SCUFFS IN THE TOLEX - W THE EXCEPTION OF THE BOTTOM (SEE PICS) - NO BIGGIE THOUGH. ****MISSING 2 OF THE LITTLE FEET ON THE BOTTOM **** Again, No Biggie - I am actually going to try to locate two of those feet either exactly like what's on there or close enough that the height is at least right. It sets perfectly fine with them missing. * Very Small amounts of Patina on the corner screws. Single Button Footswitch. HQRP® Single Button Footswitch;. Compatible with following P/N: Marshall PED801;. Cable Length: 6 ft;. Thewarranty and the technical support - You can always turn to us for qualified help;.